Utilizing digital assistants from Siri to Cortana, from Alexa to Google Assistant, is producing a dramatic increase in voice-based search. As each year passes, the presence of devices that offer voice search continues to grow at a fast pace. It’s not just an idea for the future, it is here and getting bigger by the day. 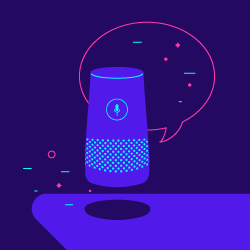 Devices such as Amazon’s Echo feature Alexa to help with voice-activated queries and commands, like, “Alexa play: Piano Man.” Google offers Google Home with a digital assistant, and of course, there’s the original: Apple’s Siri, which first came on the scene in 2011. According to Amazon, tens of millions of consumers have purchased Alexa devices, which explains why last year alone 41% of U.S. adults, and over half of teens, used voice search on a daily basis. for effective strategies for adapting to change. Here’s the catch: voice-based search queries are usually drastically different than typed queries. When users search by voice, they form questions in full sentences as opposed to typing in keywords most commonly done in traditional search. How does this affect my chamber? With the continued growth, optimizing for voice search is no longer optional, it is a must for all organizations. Eventually, old SEO methods will lose their effectiveness. Businesses will be forced to tailor their online presence to keep up with voice technology. Strategies of the past which centered around certain keywords (and their variations) will no longer be as effective. New ways of optimizing means thinking about how people actually talk. Chambers need to focus their SEO on directly answering questions from members (or potential members), to provide the voice search outcome they desire. The key is to form questions with longer queries that can fit voice search terms. for 5 tactics for digital engagement. Low hanging fruit: Start with your member or potential member FAQ’s. If you don’t already have them outlined on your website, this is the time. Frequently asked questions can provide the framework needed to develop a more conversational tone to answers specific questions easily fueling your new search strategy. Hint: FAQ’s also offer your great direction for social media, video, and PR content. The best way to prepare for this growth? Use the technology yourself to get an understanding of the kinds of results it provides.